You may have seen it on the Today Show, New York Times, or all across social media. 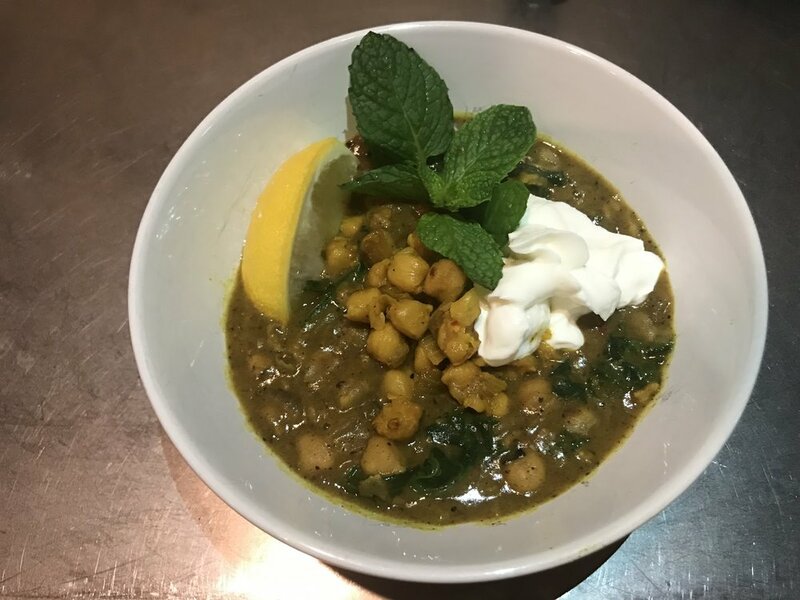 Alison Roman’s Spiced Chickpea Stew with Coconut and Turmeric is actually her second recipe to go viral, after her Salted Chocolate Chunk Shortbread Cookies. What makes a recipe reach viral status? After observing the trends surrounding Roman’s recipes, my guess is that it’s a combination of a few things. They’re relatively simple, utilize ingredients that are easy to find, and the resulting dish is greater than the sum of its parts. This chickpea stew is the perfect example of that. Canned chickpeas (or garbanzo beans), coconut milk, and a basic stock are elevated by garlic, ginger, turmeric, and red pepper flakes – what seems straightforward, simmers down to a hearty and flavor-packed stew! The one surprise: how quickly it comes together. Most of the work comes in at the beginning, when chopping up an onion, four cloves of garlic, and bit of ginger. (Pro tip: peel, chop, and freeze a big batch of garlic, so that it’s always ready for recipes like this.) After a brief sauté, you add in spices and chickpeas to brown them up. After pulling about a cup of chickpeas out for garnish, in goes the coconut milk and broth to simmer for about a half-hour. Once the stew is ready, assembly is a breeze. Top it with the crispy chickpea garnish, greek yogurt, and fresh mint leaves. I also added a squeeze of lemon for extra brightness. You can find everything you need for this recipe at Bushwick Food Cooperative, and it’s vegetarian (or vegan if you skip the yogurt). Try it out for yourself, and don’t forget to tag @bushwickfood on Instagram with your delicious results!